The T-45 Goshawk is a fully carrier-capable version of the Hawk Mk.60. It was developed as a jet flight trainer for the United States Navy (USN) and United States Marine Corps (USMC). Originally a British design, this aircraft has been adopted by the US Navy for training and tactical multi-role purpose. The Hawk has been a worldwide best seller and the aircraft now is service has all around performance superior to original expectations. Variants of the Hawk include the T-45A a two-seat basic and advanced jet trainer for the US Navy, the T-45B proposed land-based version for the US Navy, which would have been basically a conventional Hawk with a USN cockpit and no carrier capability. The USN had wanted the T-45B to get an earlier training capability, but abandoned the idea in 1984 in favor of less-costly updates to the TA-4J and T-2C, and finally the T-45C improved T-45A with glass cockpit, inertial navigation, and other improvements. Existing T-45As are being upgraded to the T-45C standard. The kit comes in the typical Italeri side opening boxing found for kits in 1983. Inside is a real treat of finely detailed recessed panel lines, 52 parts in all. Cockpit includes a finely detailed two seat tub with ejection seats with harnesses, two different detailed instrument panels and rather large control sticks. The landing gear is well represented with only one are of concern with the main landing gear doors have small sink holes. External stores pylons are provided however you will need to drill out the holes for the pylons prior to assembling the wings no weapons are included, arresting hook is included. The back of the box provides an excellent color profile for the trainer Goshawk with both F.S. and Model Master colors listed for Florescent Red F.S. 28915, Insignia White F.S. 17875 and Flat Black F.S. 37038. 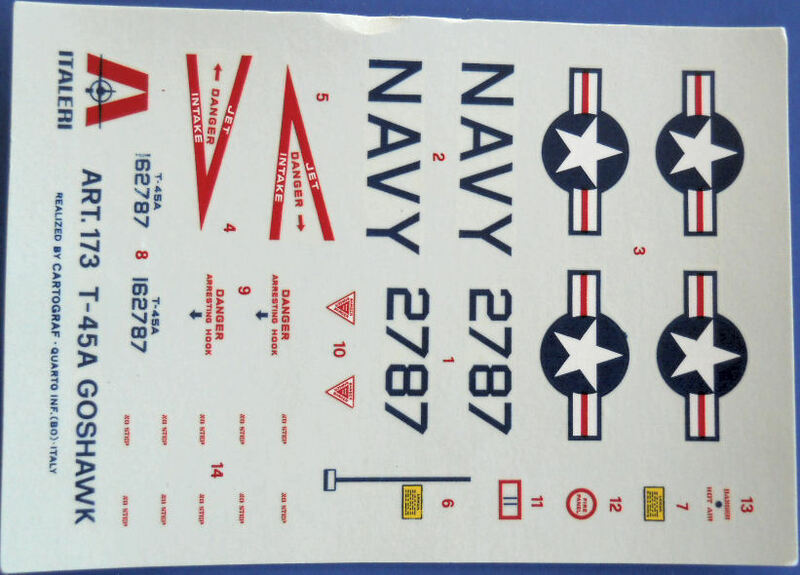 Decals are provided for the first development T-45 aircraft (BuAer. 162787), Ship 1, which was rolled out at Long Beach, California, on 16 March 1988, and made its maiden flight on 16 April 1988. 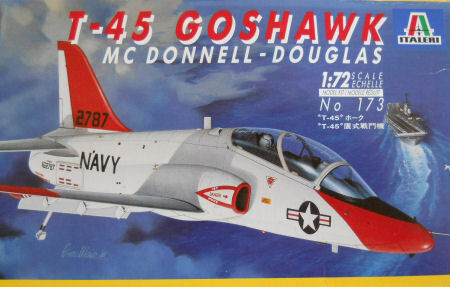 This is the only game in town for the T-45 Goshawk and it is currently out of production, I found this one on eBay. 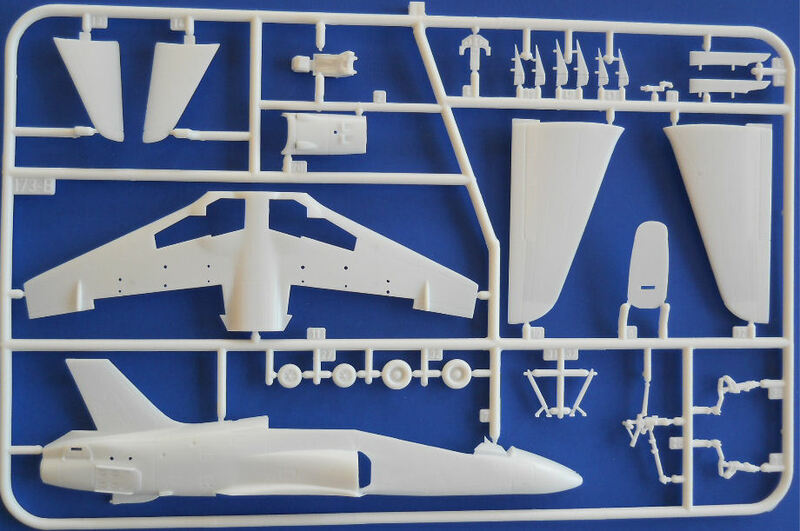 it is a nice model of the first production aircraft, and it will look great when complete.